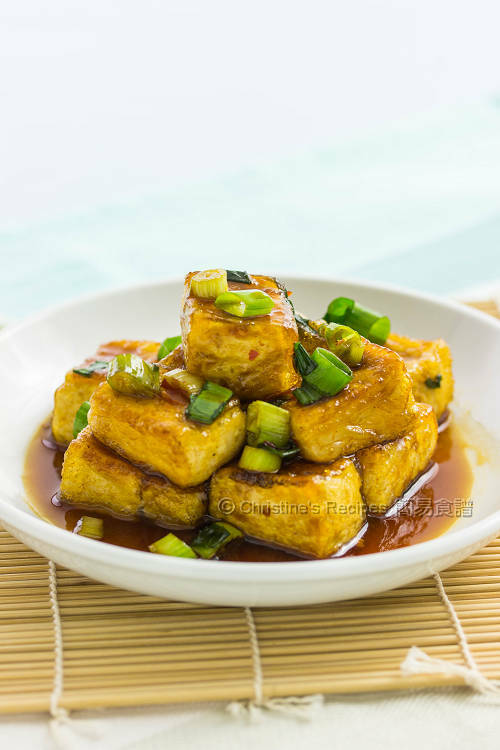 The taste of Teriyaki sauce is rich and addictive, making you want more of the nutritious tofu. Whenever I go for ordering or making my own Japanese dishes, I’d think of those with Teriyaki sauce. It’s nice and sweet, easy to make. Just blend all ingredients together. There you go. I reckon Teriyaki sauce is the prime sauce that goes really well with many kinds of meat, chicken, eel, beef. 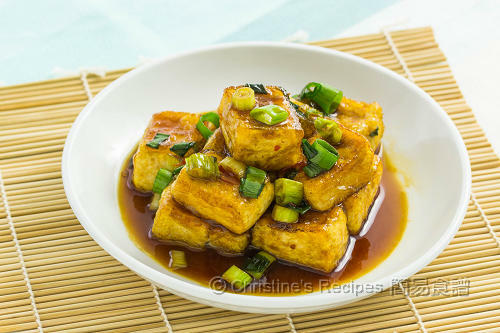 And even more, it’d wonderfully turn the humble and bland tofu into an elegant and delicious dish. It’s a versatile sauce you’d never want to leave it out in your home cooking. It can be whipped up on the go. The taste of Teriyaki sauce is rich, delicious and addictive, making you want more of the nutritious tofu. Here’s my version of teriyaki tofu. Hope you like this dish as much as my family does. Wrap tofu with several pieces of kitchen towels to absorb the excess water. Cut into 3cm dices. Lightly coat the tofu with potato starch. Heat oil in a frying pan over medium high heat. (Remark: If you see some bubbles arise around a pair of chopsticks in the oil, that means the oil is hot enough. ) 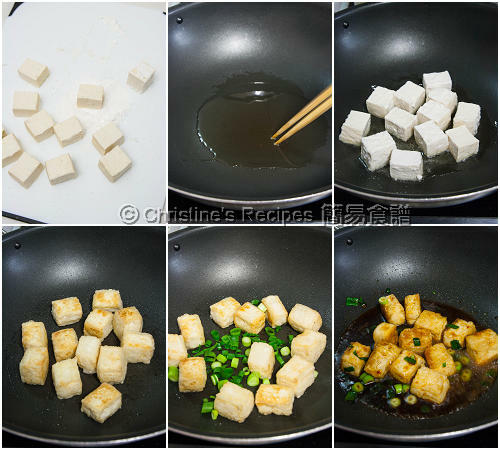 Pan fry the tofu until all sides are lightly brown. Add in the grated ginger and half of the spring onion. Stir to combine. Pour the seasonings. Once it boils, turn off the heat. Sprinkle the rest of the spring onion. Serve immediately. Potato starch is available at Japanese supermarkets or Asian grocers. If you can’t get it for any reason, you might replace it with corn starch. Mirin is a key condiment in Japanese cooking, also available at at Japanese supermarkets or Asian grocers. u mean the seasonings is the teriyaki sauce? I remember your teriyaki chicken recipe using the same kind of ginger/mirin/sake/sugar/soy combination. I loved it so much I make it a regular dish I like to cook week in week out. I also swapped the chicken with beef skirt and used it as a filling for sushi roll and it was AMAZING! Thanks for your love my recipe. The teriyaki sauce is so versatile and perfect for cooking with any meat. You can whip it up in a few seconds. That's why I love it too. I love your idea of making sushi roll with teriyaki beef. Very creative. HI Christine - this dish looks so yummy ! can I ask what brand of mirin and jap cooking wine you using? I used Hinode mirin and Mizkan cooking wine.